The ferry industry is gearing up for growth with more than £1 billion of investments announced for new ships, port and service facilities in the next four years, according to figures released today by Discover Ferries, the industry body for ferries. Emma Batchelor, director of Discover Ferries, which released the investment statistics, said the figures reflected the sustained popularity of ferry travel. “More than 39 million passenger journeys are made by ferry to UK islands, the Isle of Man and Ireland, France, Spain and Holland,” she said “and those sustained numbers are enabling ferry operators to invest with confidence in new ships and new routes. “Ferry travel today is transformed compared to a decade ago and enjoys a loyal following of travellers who value comfort and space. MBNA Thames Clippers introduced two new boats last year – Mercury Clipper and Jupiter Clipper. This was a £6.3 million investment to meet demand as the growing business carried over 4.1 million commuters and visitors around London on the River Thames in 2017 alone. MBNA Thames Clippers has the largest commercial passenger fleet operating solely in UK water and predicts it will carry over six million passengers by 2020. The company started serving a new pier at Battersea Power Station in November 2017, taking the total number of piers MBNA Thames Clippers serves to 22. The pier is the latest addition to London’s most popular river route – RB6 – which has seen an increase of 58 per cent commuter traffic in two years due to continued investment and expansion from MBNA Thames Clippers. The company proposes to expand services to Royal Wharf, New Providence Wharf and Trinity Buoy Wharf as part of their continued investment in the river transport network. In 2017, Stena Line completed a multi-million-pound investment package to acquire the Superfast VII and Superfast VIII ferries which operate on its Belfast-Cairnryan route. The purchase of the Superfast vessels was part of Stena Line’s ambitious development plan. The vessels had been operating under a charter contract agreement with AS Tallink Grupp before Stena Line took over formal ownership of the vessels in December 2017. Portsmouth International Port is also investing for the future. This month, the linkspan used to load and unload vehicles from ferries at Berth 4 at Portsmouth International Port is being replaced as part of a multi-million-pound investment. In recent years, millions of pounds have been spent on a number of important projects which include lengthening Berth 2; removing the ‘floating dock jetty’ to improve navigation; dredging to increase depths for bigger cargo ships and moving HMS Bristol to increase the turning circle for larger vessels. Irish Ferries is introducing its new £128 million cruise ferry W.B. Yeats. The new ferry - currently being built in Germany - is expected to weigh in at 55,000 tonnes. W.B. Yeats will sail between Holyhead and Dublin from mid-September 2018, delivering additional capacity for 1,885 passengers and crew and 1,200 cars per crossing, onto the busiest ferry route between the UK and Ireland. Fabulous facilities on the new ship will include a Club Class lounge with direct passenger access from the car decks, à la carte and self-service restaurants, a cinema, a shopping mall, a choice of bars and lounges and an outside promenade deck. There will also be 441 cabins, including luxury suites with their own private balconies. During summer next year, the new ship will offer Irish holidaymakers a cruise style travel experience, sailing between Dublin and Cherbourg. When coupled with the existing vessel the Oscar Wilde, which currently sails between Rosslare and Cherbourg and Roscoff, it will double the number of sailings between Ireland and France, with planned daily departures in alternate directions. 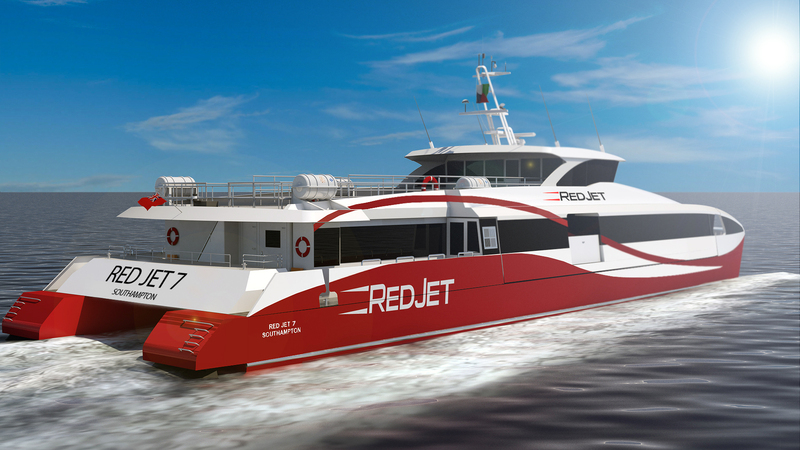 Red Funnel Isle of Wight Ferries is investing £7 million in a new high-speed catamaran Red Jet 7 which is being built at the Wight Shipyard Company on the Isle of Wight sustaining 85 local jobs. The 277 passenger Red Jet 7 will come into service between Southampton and West Cowes in early July and is a sister ship to Red Jet 6. She was launched in 2016 and set a benchmark speed record for circumnavigating the Isle of Wight, averaging 38.8 knots. In addition, Red Funnel is investing over £3 million in the major interior refurbishment of its ro-pax ship Red Eagle to give her a contemporary new look in time for Easter. The refit includes the addition of Red Funnel’s flagship Signature Lounge which offers travellers a host of tempting benefits. The company has also given the green light to a £10.5 million investment to extend and relocate its East Cowes ferry terminal. Phase 1 will be completed by the summer with the final phase delivered by 2020. Finally, Red Funnel recently confirmed Kevin George would step up to the role of chairman with the company following his stint as chief executive. 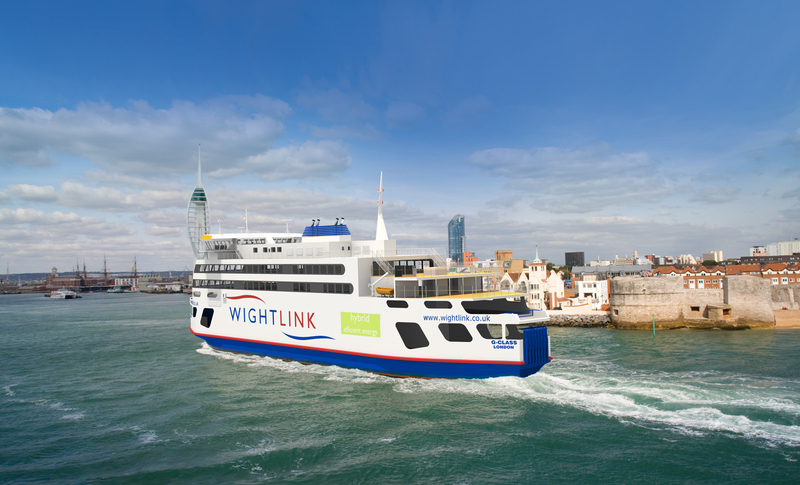 New for summer 2018 is Wightlink’s Victoria of Wight – a new hybrid car ferry operating between Portsmouth and Fishbourne on the Isle of Wight. The gleaming new ship will have the capacity to carry the equivalent of 178 cars and more than 1,000 people on each crossing. Powered by hybrid energy, the new ferry has a host of features to minimise the ship’s impact on the Solent and its shoreline including a sophisticated power management system, recycling engine heat to warm water and indoor spaces, and a modern hull designed to create low levels of wash.
New double deck loading ramps have also been built at Wightlink’s ports at Portsmouth and Fishbourne as part of the £45 million investment, for faster loading and unloading times. Later in the year, Caledonian MacBrayne ferry customers will benefit from the UK’s first liquefied natural gas passenger ferry, MV Glen Sannox. The innovative dual fuel vessel was announced at Ferguson Marine Engineering’s Port Glasgow shipyard and is the first of two LNG ferries being built as part of a £97 million contract on behalf of Caledonian Maritime Assets. The 102-metre, roll-on/roll-off ferry, is designed to carry 127 cars or 16 HGVs or a combination of both and up to 1,000 passengers. The vessel is due to be delivered to ferry operator Caledonian MacBrayne (CalMac Ferries) in winter 2018. Ferry travellers to the Clyde island of Arran will also soon be able to benefit from a major upgrade to the terminal facilities at the port of Brodick. The extensive redevelopment project represents a major investment of around £30 million, led by CMAL, with support from Transport Scotland, North Ayrshire Council, Strathclyde Partnership for Transport and Coastal Communities Fund. 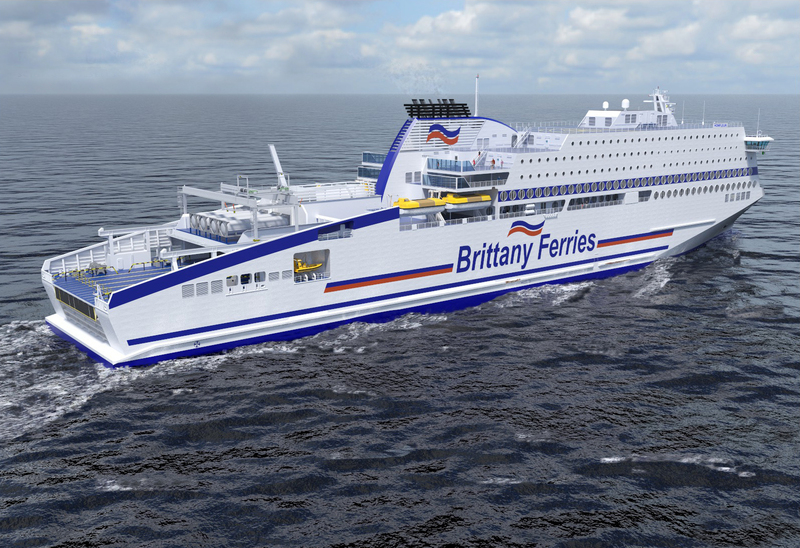 In March 2019, work will begin on Brittany Ferries’ new £175 million state-of-the-art new ship named the Honfleur, on the popular Portsmouth-Caen route. The ship will be built in the Flensburger Schiffbau-Gesellshaft shipyard in Germany and will be powered by liquefied natural gas. LNG emits less carbon dioxide than diesel following combustion and burns with no smoke. It is entirely free of sulphur and produces very low emissions of nitrogen oxide and particulate matter. Every aspect of Honfleur’s interior has been carefully considered with the digital age in mind. Free Wi-Fi will come as standard in all cabins and public spaces, and a digital information lounge will serve as her focal point. Quiet lounges, panoramic views and reading areas will complement cabins designed to soothe and reflect the unique ambience of a short voyage by sea. Stena Line’s ambitious development plan involves the construction of four new ro-pax vessels which are being built at the AVIC Shipyard in China. The four new 1,000 passenger ships will be delivered during 2019 and 2020 with Stena having an option on a further four vessels as part of the overall contract. The vessels will be 50 per cent larger than today’s standard ro-pax vessels and this significant investment will see a continuation of Stena Line’s successful concept which mixes freight and passengers as part of its operational business model. The new ferries will be among the most energy efficient in the world with significantly lower emissions compared to similar tonnage. As well as W.B Yeats, Irish Ferries has ordered a second new cruise ferry which will start sailing between the UK and Ireland in 2020. The cruise ferry will be built in Germany at a cost of £147 million. When built, the new ship will be the largest cruise ferry in the world in terms of vehicle capacity, offering space for up to 1,500 cars, or up to 330 freight trucks. It is expected to weigh in at approximately 67,300 tonnes. The cruise ferry will be designed specifically to sail between Holyhead and Dublin, in tandem with Irish Ferries’ current flagship Ulysses, which will replace the chartered ferry Epsilon. Discover Ferries is an industry body representing 11 ferry operators in the UK and Ireland operating more than 75 routes. Its role is to promote ferry travel and holidays. The carriage of freight vehicles is also a very important part of the Discover Ferries’ members’ business.